Having enjoyed immense popularity among Taiwanese railway bento fans, Woo Ricebox has come up with two new flavours – Steamed Spare Ribs Bento and Steamed Salted Egg Minced Pork Bento ($6.90 each), alongside their best selling Spicy Drumstick Bento and Woo’s Fried Pork Chop Bento ($8.90 each). Each box is packed with tasty morsels that fill you up quickly, with the main star being the different meats. Boasting different flavours from Singapore and Hong Kong, this is the stop to make if you are looking for a quick breakfast fix. 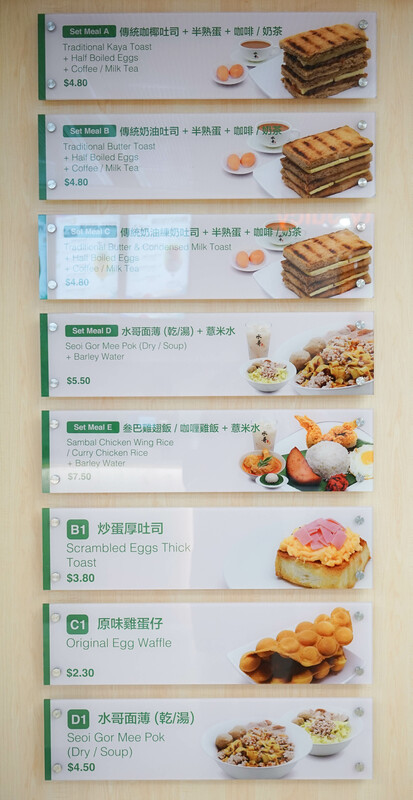 From local comfort food like Sambal Chicken Wing Rice ($5.50) and Traditional Kaya Toast ($1.90) to Hong Kong brunch staples including Scrambled Egg Thick Toast ($3.80), one can expect a wholesome meal at this refurbished cafe. Gong Yuan Ma La Tang is a new dining concept that offers your favourite spicy sensation in a drinkable dish. Take your pick from over 20 choice ingredients ($2.68 per 100g) and four types of slow cooked broths (Signature Spicy Ma La, Pork Bone, Preserved Vegetables, and Vomato), before enjoying the slurpy goodness. While the Signature Spicy Ma La was milder than I expected, it still left me with that familiar numbing sensation. The Preserved Vegetables broth yielded a distinct, sour note that tingled my tastebuds. Both broths are highly recommended as they are not too strong in taste, and go well with the ingredients! With a variety of food options available, one can hardly go hungry at Seoi Gor Cafe. Thanks for having me!